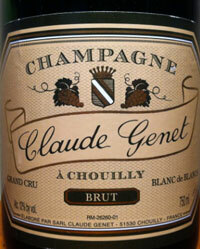 Claude Genet Champagne is a Grower Producer of light styled and elegant Blanc be blancs from Chouilly, Cote de Blancs, France. I am enjoying a glass of their wine as I type this. It is a little known family house, where all the wine making is hand done. The famous wine critic, Robert Parker, in December of 2009 described it as as "under-the-radar, tiny artisanal house of Genet. This delicious, pure, crisp, light to medium-bodied Champagne is not the most complex style one can find in Champagne, but at this price point, it has been and will continue to be my house Champagne for some time to come" and gave it 92 out of 100 points. Noted wine Critic Steve Tanzer, a notoriously low scorer comparer to Parker, also rates it around an average of 90 points, high praise indeed. It is also the house Champagne at noted restaurant, the Michelin starred Eleven Madison Park in New York City. Most of this wine imported into the USA is goes to Eleven Madison Park, but I procured a bit from the Rare Wine Company. What I tried is 1/3 2005 vintage and and 2/3 2006 vintage. Drank twice with similar notes. A very light yellow color, very light even for a Blanc de blancs, with hordes or smallish bubbles. On the nose there is fresh baked hard crusted bread which I could even smell upon opening from 2 feet away, together with some slate and minerals. On the palate this is light and lively, with a tough of (orange?) citrus. Delightful and fresh, I did not note any green apple as other have, but as it warmed I sensed some warm golden apple. (second bottle - yes, I got green apple). This is a very light and elegant Champagne. Light in this case is not a flaw but a stylistic choice, and (non professional) reviewers comments are mixed between needs more power and structure and elegant/lovely. I dig it, but would be sure to serve it first at a wine dinner, tasting, or other event.